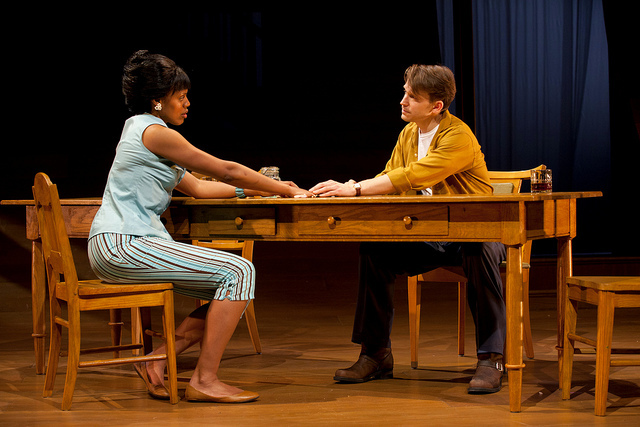 Nikkole Salter and McCaleb Burnett in Kirsten Greenidge’s THE LUCK OF THE IRISH. March 30 – April 29, 2012 at the Calderwood Pavilion at the BCA. huntingtontheatre.org. Photo: T. Charles Erickson. The Luck of the Irish by Kirsten Greenidge, Huntington Theatre Company, Boston Center for the Arts Virginia Wimberly Theatre, 3/30/12-5/6/12, http://www.huntingtontheatre.org/season/2011-2012/The-Luck-of-the-Irish/.